Nana Marfo was kind enough to nominate me for the Sunshine Blogger Award! Thanks Nana! You can see his nomination and questions here! He’s a fellow game designer so show his blog some love. He has a portfolio available as well as regular gaming blogs like reviews and first impressions! What is your favourite video game? This is always the hardest question for me to answer. My current obsession is Stardew Valley. Which game character would be your big brother/sister? Farkas from Skyrim. I really enjoy his character and everything he teaches you while you’re becoming a Companion. Do you watch anime, and what’s your favourite one? Yes! My all time favorite? InuYasha. Sonic or Mario? Hmm… Mario. Only because I haven’t played enough Sonic games to have an informed opinion on him. Which video game world would you want to live in? Animal Crossing. You can read more about my answer here. What is your dream Job, and why? Would you believe that I don’t know the answer to that anymore? I thought I wanted to make video games, and a part of me still wants that, but I don’t know if it’s my dream job anymore. Favourite Sport (BlitzBall doesn’t count)? I can’t really think of a sport I enjoy. Does Pokemon Go count? My friend code is 5731 6148 1911. Where do you want to go in the world the most? Right now, I’d love to go to Spain with my husband. First Video Game? Spyro the Dragon on the PlayStation 1. You can read more about my answer here. Why did you start blogging? 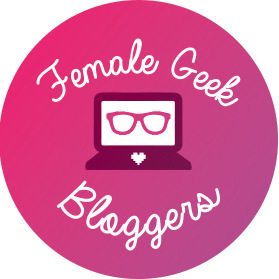 I started blogging as a creative outlet and when I started writing about gaming and geek fashion, I discovered my niche and A Geeky Gal was born! Where do you plan to go from here for the rest of the year on your blog? I wrote about my blog resolutions at the beginning of the year and then again in June. One of my big goals is that I really want to expand to YouTube this year. What are 3 interesting facts about yourself? How has your blog changed since it was first created? If someone wanted to understand you, what game would they play? What is your favorite video game quote? If your favorite character had a modern song as their theme, what song would it be? What is one thing you want to change about your blog? What blog posts do you read the most? I’ve played several games from both franchises, and I would say Mario indeed has the superior set of games. It’s no contest, really. Some great answers here Meg! Yesssss! I rack up some steps when I hit up gyms and pokestops.